The Joe’s sells a 16.9oz of OKF’s aloe drink for $1.99 before stupid CRV. Today at the 99 Ranch, the 50.67 oz of HanAsia’s aloe drink is $2.48 before the California Recycle Tax. (shelf had sticker of $2.79). The Asian vendor sells the Asian style drink for about half the cost of the White People vendor. 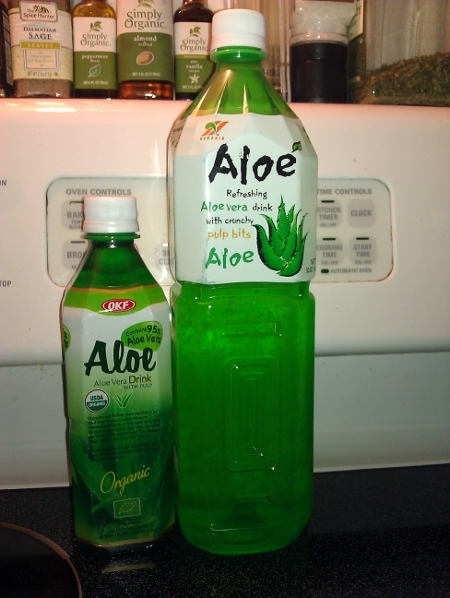 Both brands of the aloe drink presented are product of Korea and imported by an American distributor. Why such a difference in cost? (we’re talking paying DOUBLE!!!! for the same thing). Oh…Organic? You mean that label that sounds good and all but recently has found lack of evidence to support healthier results by Stanford University School of Medicine? That alone justifies a 100% cost premium?! Those upper middle class elitists in their luxury SUV’s carting canvas bags from Whole Foods and Mothers can get off my lawn front condo patio! (I can’t afford a lawn here). If it was up to them everything would be Organic and all food items would be out of reach for far more Americans because production would be more expensive and/or supply would be less. Besides, we’re talking about a flippin’ cactus plant here; how much “evil stuff” is really used to mass produce cactus? And we’re using the inside of the aloe plant. It can’t be just the certification though, because Joe’s does sell good organic produce at prices that rival the conventional produce found at Vons, Ralphs, Stater Bros and the like. Even though the low pesticide levels in conventional produce aren’t shown to have a health impact, the organics do have a taste advantage so we do still get them when reasonable to do so. Perhaps the Asian grocer knows that the typical Asian is ultra frugal, and thus must compete in the market as such to attract those hard-to-separate hard-earned dollars? (And their typical clientele don’t worry about B.S. like certified-Organic and grass-fed, and union-labor produce as long as they’re still eating good fruits and veggies, and will certainly refuse to pay more for it) I mean, the Asians have to save money to send their kids to Medical, Law, and Engineering schools, and save up the extra cash for high end electronics and fast cars, right? ;D –There were some WRX’s in the parking lot along with the usual Lexus, Mercedes, BMW, and also for us mortals, Honda/Toyota. So the lesson here is to buy the right goods from the right vendor. And it really is cheaper where there’s less Hybrid cars in the lot and the folks stocking the shelves barely speak any English.